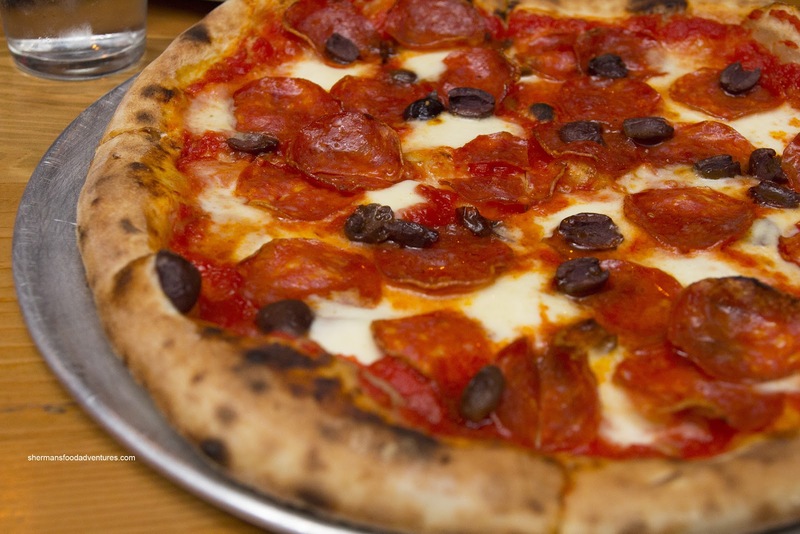 It has been a fast & furious year for Neapolitan-style pizza in Vancouver in 2012. In addition to Novo, BiBo, Nicli Antica and Verace we saw the appearance of Farina, Famoso, Via Tevere and Barbarella. I've tried them all and there are definitely ones that stand out. 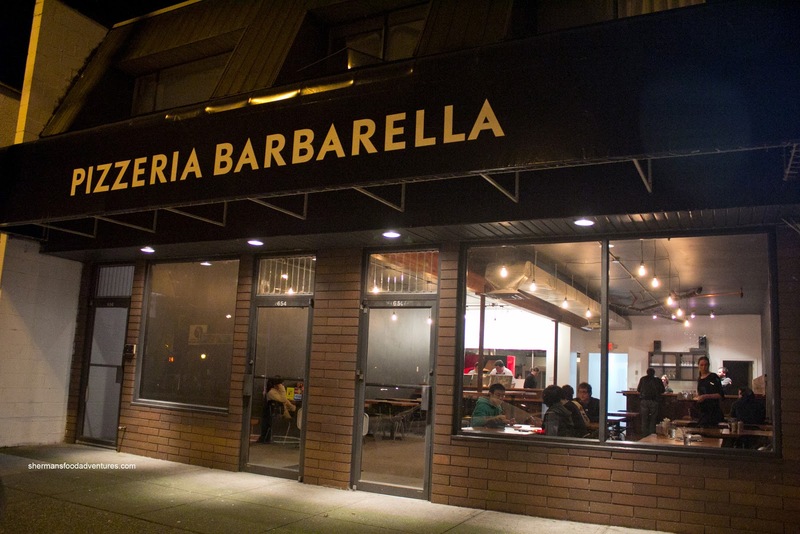 One of them is Pizzeria Barbarella, operated by Terry Deane, who originally ran Ah-Beetz out in Abbotsford. I had the good fortune of trying the place out before he sold it, so he could open up shop in Vancouver. I was looking forward to its opening because I knew it would be good. 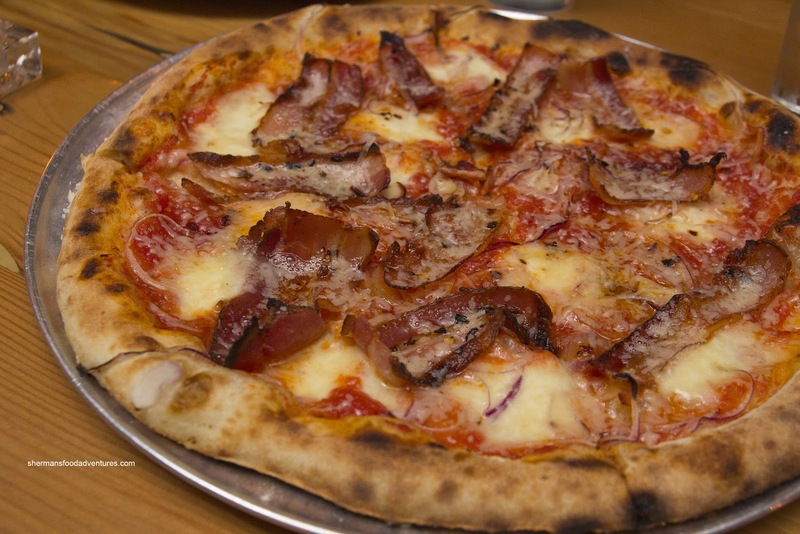 In a way, Terry helped introduce thin-crust high-heat cooked pizza to the Lower Mainland, albeit out in Abbotsford. I was so excited that I went on opening night of Pizzeria Barbarella. Nearly one year later, I thought it would be a good idea to see how they were doing. In fact, we were a table of 12, half of them kiddies, since we had just done the Stanley Park Christmas Train. A hungry and boisterous bunch! With such a large group, we got 8 pizzas to share including one of the Amatriciana consisting of tomato, fior di latte, aged mozzarella, house cured and smoked pancetta, red onions, fresh garlic, chili flakes, parmigiano reggiano and extra virgin olive oil. 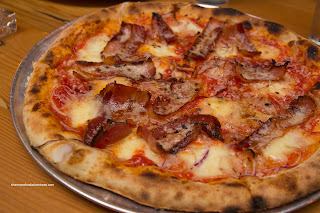 Unlike last time, there were noticeable pieces of pancetta on top which added plenty of savouriness to the pizza. There was some spice from the chili flakes and plenty of cheesiness as well. The plethora of toppings did make the crust a bit softer than the rest of the pizzas. With that being said, there was a good amount of leoparding which ensured a smoky-nuttiness. I thought the dough was adequately seasoned as well. 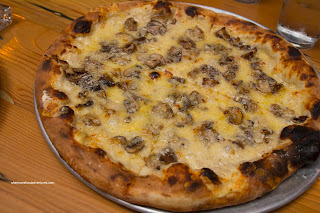 Hands-down, our favourite pizza was the Funghi (much like last time) with besciamella, fontina, oven roasted cremini mushrooms, parmigiano reggiano and white truffle oil. Being less salty than last time, this was a tasty pizza. Lots of Earthiness going around from the mushrooms and the drizzle of truffle oil. With less moisture, the crust was significantly more crispy. I liked how it was chewy enough, without being difficult to eat. Our second favourite pizza was the Salsiccia consisting of tomato, fior di latte, aged mozzarella, house made fennel sausage, pickled peppers, basil, parmigiano reggiano and extra virgin olive oil. We thought the fennel sausage and the peppers defined the flavour profile of the pizza. The pickled peppers added a zing which really added to the mild-tasting tomato sauce. The next pizza was the Diavola with tomato, fior di latte, aged mozzarella, spicy salami, nicoise olives and extra virgin olive oil. It may of looked like a pepperoni pizza, but it certainly was not. The spicy salami lived up to its namesake while the olives added another burst of flavour. 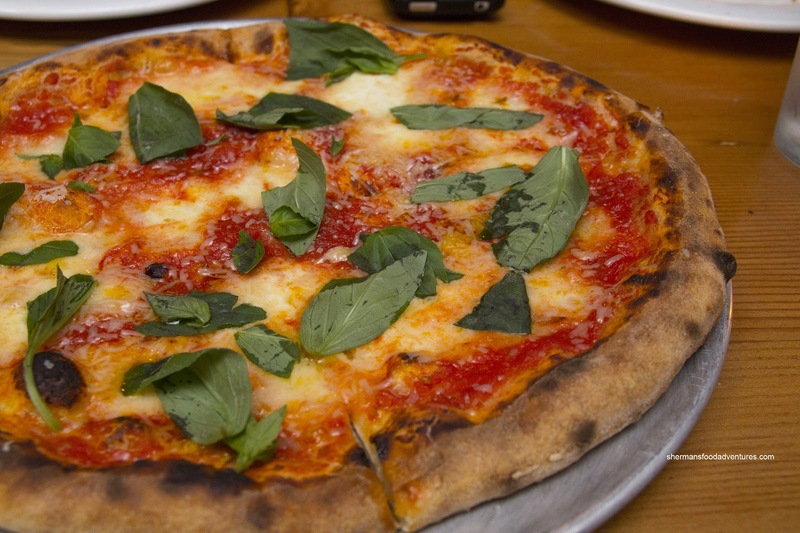 Last but not least, the classic Margherita arrived. With plenty of fresh basil (added after the fact) and a beautifully baked crust, this was a solid pizza. Considering that most of the ingredients are made in-house and the care that is put into each pizza, I would not hesitate to put Barbarella in the top-3 of thin crust pizzas in town. First I would like to thank you for cutting back the sports and camera bits. I commented a while ago about it and it seemed that the very next post.... Thank you. I do like that you drop a line here and there about them though. It gives your blog a community feel I think. I have been telling anyone that listens about your reviews. While I don't read the majority of your reviews because of length, you really do a deep review. So when I need to know about a restaurant, I am happy you do go into as much detail as you do. Have you considered putting a picture of the final bill into your blog? Wouldn't it be nice to see the actual cost of things? I went to a restaurant a couple of years ago (I don't remember the name) and they charged me $3.50 for a coke, on tap! It would great if I knew before hand that they were going to nickle and dime me to death. I am happy to keep seeing you mentioning Farina and its crust. I make the dough. It's all I do there. They ripped us off! They charged a 17% Gratuity for a table of 5 Adults and 2 Children (both of them were aged in single digits). Ergo the party is considered of six guests or more in their eyes. The wife found the pizza a bit burnt and I wished for more meat on my pizza. The group's beef was that the service was poor. We managed to obtain 4 bottle of their generic "bottled" water and the waitress only came down to see us to either bring down the food or ask how it was; you know, simple staff stuff to do at a table; it just felt that we paid for crap service.